Something about the start of the fall season always makes me feel like it's the start of a new beginning. Perhaps it's because school has always started in late August or early September. Every fall marks the start of something new and this morning was no exception. As a non-sandwich lover, of all things, I woke up this morning craving sandwiches. My initial instinct was to try out Noble Sandwiches, a local favorite, but sadly both of their locations were closed for the holiday. Instead, I found myself at my failproof, favorite cafe in Austin, epicerie. When eating alone, seating is fairly quick, and placing orders fast. Possibly the most uncomfortable moments are when waiting for your order and when waiting for the check. Typically, that is when most people use conversation to pass the time. I suppose that is why lone eaters often bring books and light reads to the table. I did not plan that far ahead. If you are truly engaged in your company, a lone eater is more like a blur in your periphery. At this specific lunch hour, most couples were enjoying the presence of each other... which left me to quietly enjoy my cup of earl grey (and awkwardly snap pictures like a tourist). epicerie's barista bar with ready-made hibiscus mint iced tea. 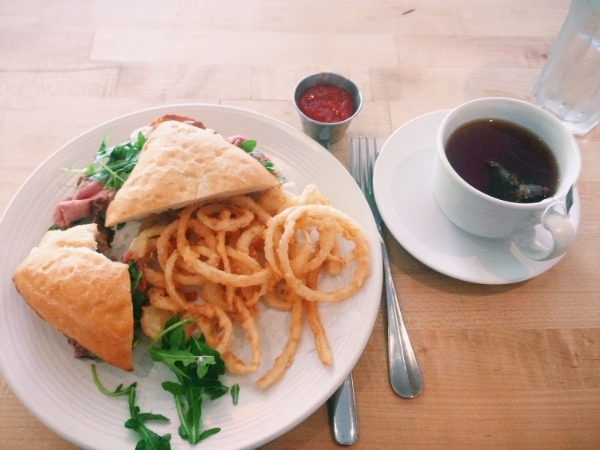 As for my sandwich craving, I ordered the shaved beef sandwhich, with arugula, horseradish, cibatta, and onion rings. I think the juice slices of beef layered with horseradish sauce really made it for me. If I didn't like sandwiches before, I'm willing to give them a shot now. epicerie Austin's shaved beef sandwich. Took a bite out of it first before deciding to capture the moment! Sometimes when I'm out dining with my husband, family, or friends, I don't give what's on my plate full attention (quite understandably). After taking a series of awkward food pictures, I cleanly finished every last bite on my plate. I ate at the pace I wanted to go without needing to fill in conversation. No rush, no bloating. Good food can be appreciated independently as well as in good company.